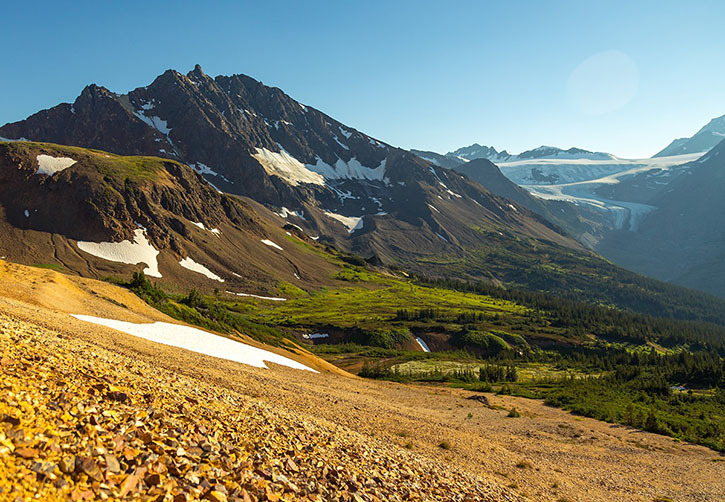 Golden Ridge Resources Ltd. (TSXV: GLDN) is actively exploring its flagship high grade Hank Au-Ag project in the heart of BC’s Golden Triangle. The project is located approximately 140 kilometers north of Stewart, British Columbia. 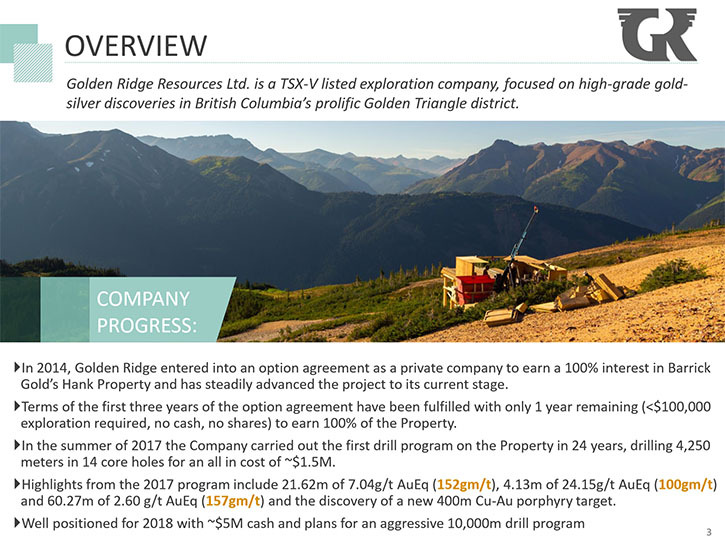 Golden Ridge may earn 100% interest in the project by performing $1.7M of exploration work by the end of 2018. 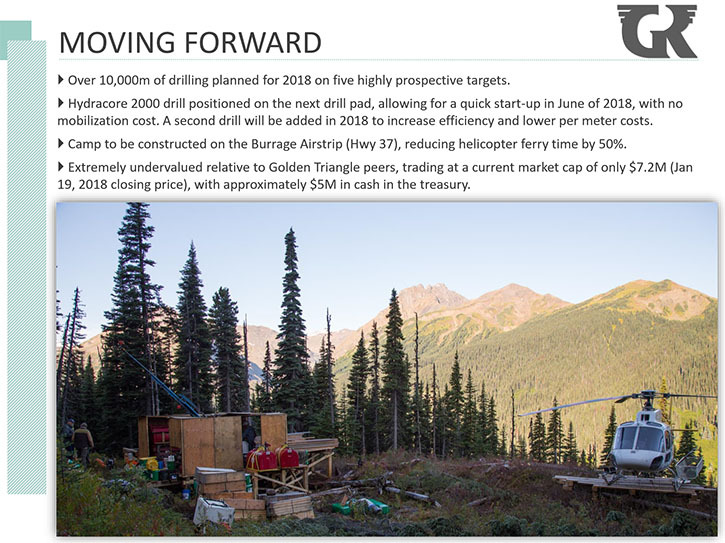 We learned from Mike Blady, CEO of Golden Ridge Resources, that in 2017, they drilled 4,250 meters at the Hank property, testing the historic geologic model that Barrick and previous operators had put forth. Their findings didn't agree with the model, so they've come up with a new model in the first couple months of 2018, which they unveiled at PDAC, with all of their new 2018 drill targets. Plans for 2018 include an 8,000 to 10,000 meters exploration drilling program that starts as early as they are able to get on the property this spring. According to Mr. Blady, very shortly Golden Ridge will earn 100% ownership of the Hank property, which is an exciting moment for the Company. 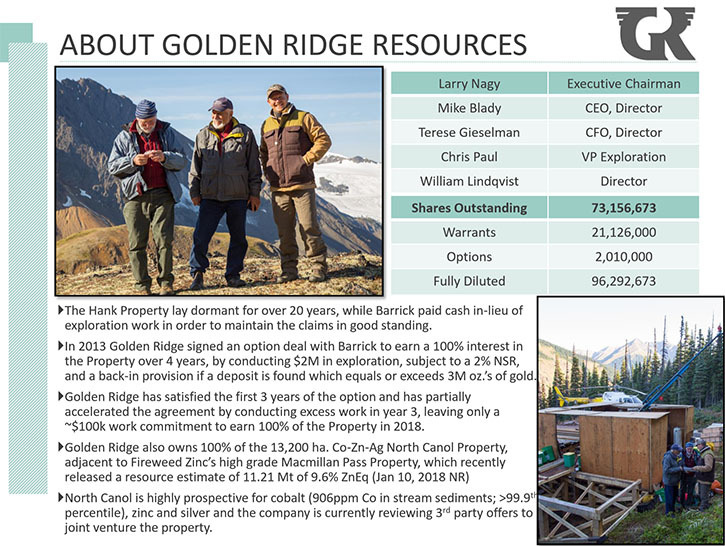 Golden Ridge also owns a 100% interest in the North Canol Co-Ag-Zn project located in the Mac Pass region of the Yukon, this project has recently been optioned to Fireweed Zinc for cash and shares. Dr. Allen Alper:	This is Dr. Allen Alper, Editor-in-Chief of Metals News, interviewing Mike Blady, CEO of Golden Ridge Resources. Could you give our readers/investors an overview of your company, your focus and current activities? Michael Blady:	Most certainly. 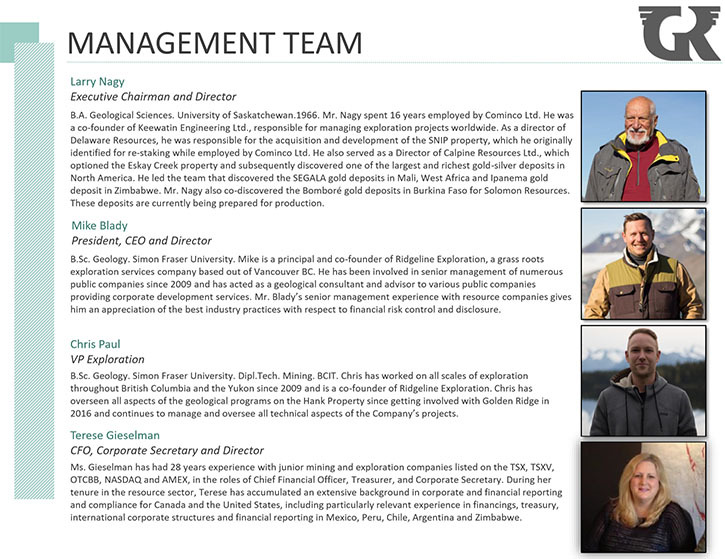 In 2014, Golden Ridge got started when they acquired a property called the Hank from Barrick Gold. At this time, Golden Ridge Resources was a private company. They spent a couple years advancing the project privately, conducting geophysics and infill sampling. In 2017, they went public via an RTO through a company called 88 Capital. The Company raised 5.24 million dollars, and I came on as CEO. We conducted the first real drill program on the Hank in over 25 years in 2017. We had some new technology, we had some new ideas, fresh eyes on the project and it has been paying off for us. In 2017, we drilled 4,250 meters at the Hank and we came up with some fantastic results. We also tested the historic geologic model that Barrick and previous operators had put forth. Our findings were that we didn't agree with the model; so we've come up with a new model here in the first couple months of 2018, which we unveiled at PDAC. We'll be drilling between 8,000 and 10,000 meters this summer targeting the five brand new untested targets this summer. Our main goal is to test our new geologic model and to vector towards the boiling zone and source of epithermal mineralization at the Hank. 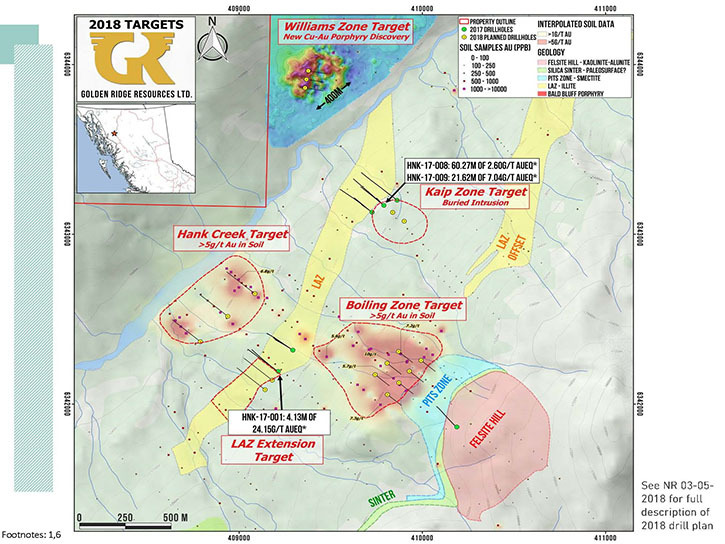 In addition to the Hank Project, Golden Ridge Resources also owns the North Canol property, which is located in the Mac Pass area of the Yukon. This property is adjacent to Fire Weed Zinc, Tom and Jason high-grade zinc deposit, which just put out an updated resource estimate. In 2017 we sold a cobalt only royalty to Cobalt 27 (KBLT:v) and just recently in 2018 we optioned this project for cash and shares to our neighbor Fireweed Zinc (FWZ:v). We will use the proceeds of these transactions to look for other properties that fit the Company’s precious metals focus. Dr. Allen Alper:	It looks like the Hank is potentially a high-grade gold deposit, is that correct? Michael Blady:	Yeah, that's correct. The Hank has been known since the early '80s. It's a very large epithermal system. The two main zones that are mineralized at the Hank are called the upper alteration zone, the UAZ, and the lower alteration zone, the LAZ. They each stretch for about two and a half kilometers. The size is definitely there. It's a question of vectoring in and finding the boiling zone. That's our goal for 2018. Dr. Allen Alper:	That sounds very good. Could you tell us a bit about yourself, your team and board? Michael Blady:	Sure. Our executive chairman is a man by the name of Larry Nagy. Larry has been working in the Golden Triangle for over 50 years, his first summer up there was in 1965. He was instrumental working alongside Ron Netolitzky in the discoveries and development of the Snip mine, as well as Eskay creek. He's also spent many years discovering mines and deposits in Africa. I'm a geologist. I've been working in the industry for over 10 years now. I've worked on a variety of projects in North America and South America in a range of roles on the technical and corporate side. I've also helped a lot of companies raise capital over the last decade. Larry and I teamed up a couple years ago, when I moved to Kelowna. That's how we started forming the team for Golden Ridge. Our VP of Exploration is a gentleman by the name of Christopher Paul. 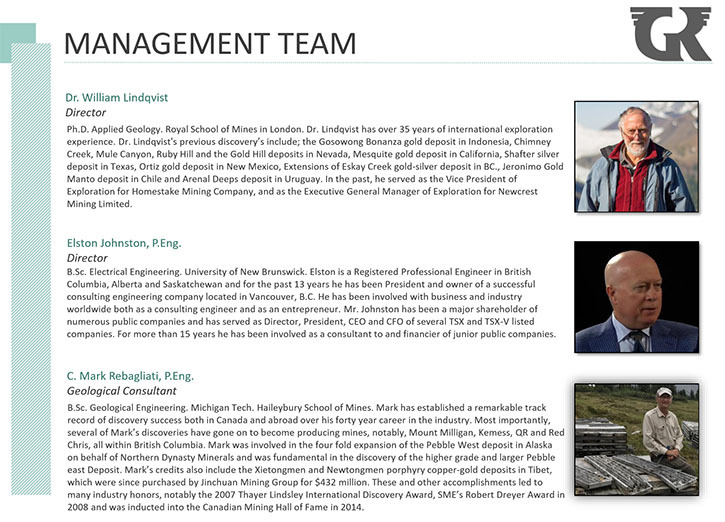 He has a Diploma in Mining Technology from BCIT and a Geology Degree from Simon Fraser University. He's worked in British Columbia and the Yukon for over 10 years. He's a very smart, young, driven individual who really loves working in the golden triangle, like we all do. Our CFO is Terese Gieselman. She has over 30 years’ experience in geo mining and exploration for companies listed, TSX, TSX Venture, NASDAQ, and Amex. Our other director of note is Dr. William Lindquist. Dr. Lindquist has over 35 years of international experience. His previous discoveries include the Gosowong Bonanza Gold Deposit in Indonesia, the Chimney Creek, Neal Canyon, Ruby Hill, and the Gold Hill deposit in Nevada. Dr. Allen Alper:	Sounds like a great team you have! Michael Blady:	Our QP and geologic consultant is Mark Rebagliati, who's recently been inducted into the Canadian Mining Hall of Fame. Dr. Allen Alper:	That's excellent, great! Could you tell us a bit about your share and capital structure? Michael Blady:	For sure. We went public via RTO through 88 Capital, which had roughly 8 million shares. Golden Ridge was a private company, up until the middle of 2017. They had about 16 million shares out. We raised 5.24 million at 15 and 12.5 cents. Right now, we're sitting with 73 million shares out and just under 4 million in cash. There're about 20 million more warrants that are exercisable at a price of 25 cents, which would bring in significant cash if we had a large discovery this year. Dr. Allen Alper:	That's great! Would you discuss the discovery a bit more? Michael Blady:	Sure. In 2017, we not only tested the geologic model and the geologic controls from previous operators, but we also did some step out drilling in the lower alteration zone. 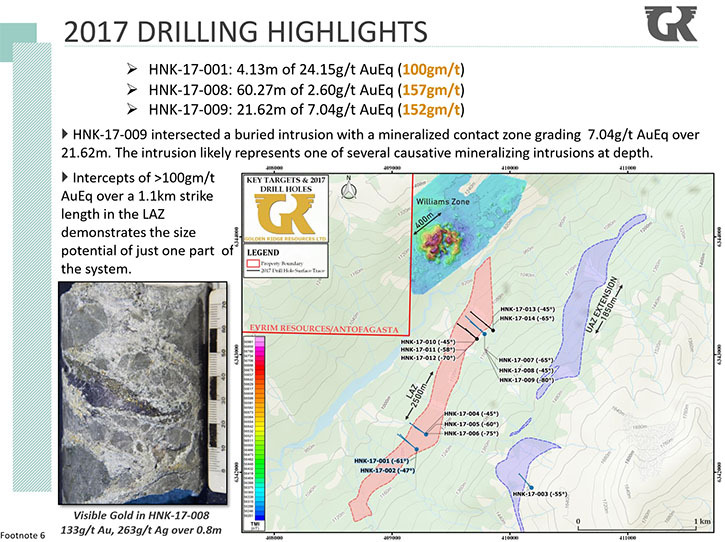 We stepped out to the northeast and drill hole Hank-17-009 intercepted 21.62 meters of 7.04 grams gold equivalent. This was heavily weighted in gold. I think it was 6.9 something in gold grams. Our first hole that we drilled, Hank-17-001, intercepted 4.13 meters of 24.15 grams per ton gold equivalent, which is about 100 gram meters per ton. We also drilled some longer intercepts, Hank-17-008 came in at 60.27 meters of 2.6 grams gold equivalent, which is about 157 gram-meters/t, if people like to convert it into gram meters per ton. I think it's a good way to assess a project, looking at how many plus hundred gram-meter intervals that are on the project. 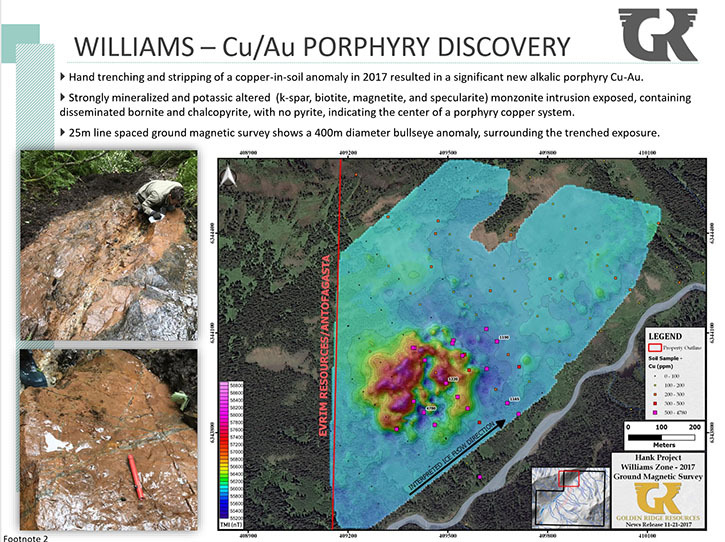 We did make a discovery of a new copper gold porphyry target, called the William Zone. It is located to the north of the lower alteration zone, across Ball Creek. It was a single-point geophysical anomaly from a 2014 Airborne Mag survey. In 2016, Chris Paul, our VP of Exploration and I soil sampled on that site. We found a large soil anomaly with some samples greater than 5000 PPM copper in the soil. The entire property has been soil sampled except for this location, and there really has never been any significant copper recorded on the project. After we received those soil sample results in 2017, we knew we had to do more work there. We did a backpack ground magnetic survey, with 25-meter spacing. We delineated almost perfect looking pipe, about 400 meters in diameter. We then proceeded to strip (it's heavily forested in this area) back the overburden using hand tools. We discovered a bed rock that consisted of a strongly mineralized and potassic-altered monazite intrusion. It contained disseminated bornite and chalcopyrite, with little to no pyrite, which to me, indicates the center of a porphyry copper system. We built drill pads on this target. It is the lowest elevation on the property, less than about 800 meters above sea level. Our drill is actually sitting there, and that'll be our first target in 2018 before we move onto our high-grade gold targets across the valley. Dr. Allen Alper:	That's excellent! What are the key things you're planning to do in 2018? Michael Blady:	We're going to be unveiling multiple drill targets here for 2018. Our number one drill target is actually between the two zones, the LAZ and the UAZ. It's about a 600-by-600 meter anomalous gold in soil of over 5g/t Au in soil, which is extremely, extremely high, even for the golden triangle, especially in an area that has been glaciated in the past. This zone, if you can believe it, has never been tested or drilled by any of the previous operators. That's going to be a really exciting target. We think this could be the boiling zone of the entire system. The reason we think that, is we did some clay minerology work and some clay mapping studies on the project. That zone lines up perfectly with the break between where the high temperature clays move into the low temperature clays. The LAZ consists mostly of sericite. When we get into the upper alteration zone, where the small historic resource of 50,000 ounces gold is (that's four and a half grams per ton), we get into transitional kaolinite alteration signature , which are lower temperature clays (to high in the system). This large anomaly that we're now calling “the boiling zone targets” could really excite the market and get the stock moving in 2018. Dr. Allen Alper:	Exciting! Sounds like 2018 will be a wonderful, exciting time for you and your team, and for your shareholders. Excellent! Michael Blady:	Thank you. Yes, we just became a publicly traded company in October of 2017. We haven't had much of a chance to get the story out to the market, and that's going to be one of our main focuses in the spring. I want to thank you for reaching out and listening to our story. Dr. Allen Alper:	Excellent! What are the primary reasons our high-net-worth readers/investors should consider investing in Golden Ridge Resources Ltd.? Michael Blady:	For sure. We have just under 4 million dollars in cash and convertible securities here. Our enterprise value is less than three million dollars for the Hank Project, which I think represents significant discounts to our peers. On the Hank Project, we have had to fulfill an option agreement with Barrick. We had to spend two million dollars in operation expenditures. We've spent 1.9 million to date, so very shortly we will be earning 100% ownership of the Hank property, which is an exciting moment for our company. Dr. Allen Alper:	Sounds great! Very strong reasons for our high-net-worth readers/investors to consider investing in your company!